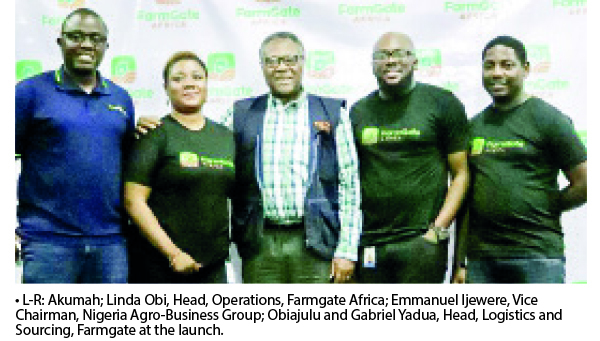 The Farmcrowdy Group has launched Farmgate Africa, an agro-trading marketplace to improve farmers’ access to markets and processors, starting with Nigeria. The initiative would adopt agrictech and new technologies to bridge the gap between smallholder farmers, the market place and to increase quality food production. Managing Director and co-founder of Farmgate Africa, Mr. Kenneth Obiajulu, said the agency would provide major processors and international buyers opportunity to purchase commodities directly from local farming clusters through technology: “As part of bridging the gap in the agriculture value-chain caused by market access, the Farmgate Africa platform would help build relationships with local farmers. “It would also enable major processors to place orders through the platform without having to go through various layers of intermediaries. Farmgate Africa would optimise market access to African farmers and improve their income by at least 30 per cent. We are leaning on the wealth of experience and operational expertise provided by Farmcrowdy Group. He identified major challenges facing farmers to include productivity, post-harvest losses and access to finance and marketing, saying that farmers were not given the financial inclusion they deserved.